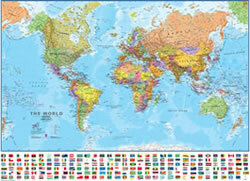 Blue Ocean Laminated Wall Map: The Blue Ocean laminated world wall map is our best value in a laminated world map. Measures 38" x 51". World Wall Map - More Detailed! 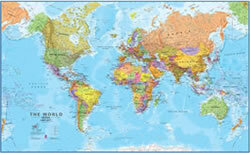 This laminated political map is a much more detailed version of the map listed above. Measures 39" x 54". 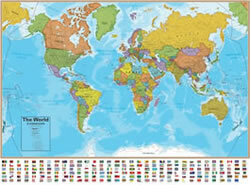 GIANT WORLD MAP: This map is huge, so please make note of the dimensions (47" by 77") and measure the wall where you plan to hang it. Laminated. 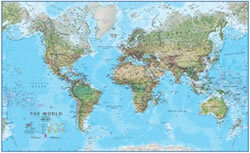 Physical Map of the World: This attractive wall map shows the world's physical terrain in addition to political boundaries. Laminated. Measures 33" x 54". 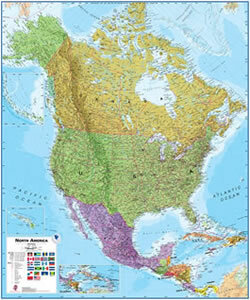 Laminated Political Wall Map of North America: This is a great map of North America for students, schools, homes or offices. Measures 47" x 39". 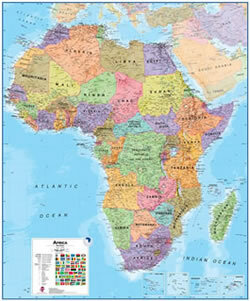 Laminated Political Wall Map of Africa: A spectacular map of Africa! Measures 47" x 39". 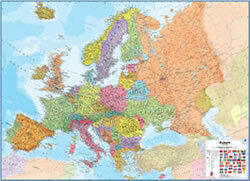 Laminated Political Wall Map of Europe: This is a great map of Europe for students, schools, homes or offices. Measures 39" x 55". 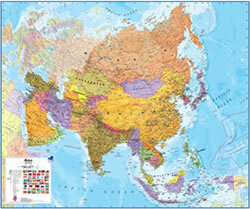 Laminated Political Wall Map of Asia: A spectacular map of Asia! Measures 39" x 47". 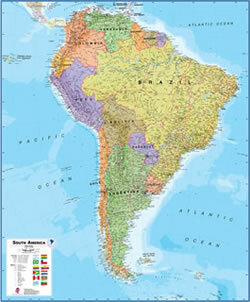 Laminated Political Wall Map of South America: A spectacular map of South America! Measures 47" x 39". 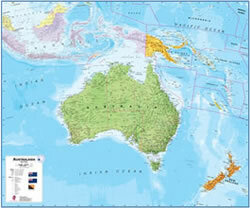 Laminated Political Wall Map of Australia: This is a great map of Australia for students, schools, homes or offices. Measures 39" x 47". 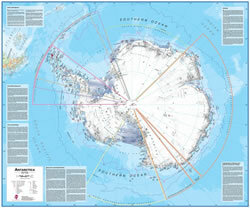 Laminated Wall Map of Antarctica: A large wall map of Antarctica and the Southern Ocean. Measures 47" x 39". 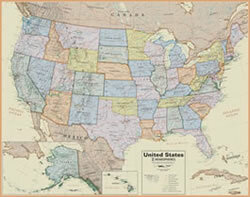 USA wall maps: United States wall maps are a popular item for elementary and middle school students who are gaining their first sense of geography. This laminated map measures 38" x 48". 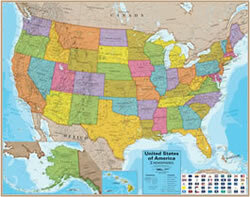 U.S. Laminated Boardroom Wall Map: A handsome map for offices and conference rooms. Measures 38" x 48".